You know why you're here, right? No? Let's start again, from the beginning. You claim to have found this secret tome, full of information about the horrors of the night. You claim there are over a dozen forms of fear detailed, complete with monsters attributed to each. You noted descriptions of werewolves and the wolf-man both under "Fear of Nature"; vampires and ghouls are detailed under "Fear of Taint"; zombies and mummies are part of "Fear of Death" . . . I needn't go on. You know how comprehensive you claim this text is. I see that you also profess that this tome contains information on those who would seek to pull back the curtain to an incomprehensible reality. These investigators can be defined in extensive traits and abilities you fully comprehend -- and you also infer this would prove invaluable to thousands of others around the world, as well. You say it also contains 18 "templates" (I believe you called them? ), enabling one to become embroiled in the descent into madness. All this information should prove quite useful in ensnaring others in your pursuit of the "truth," eh? But this is not all you claim this volume has, am I correct? No, you say it also contains an in-depth look at how to craft a revelation of horror. Descriptions of types of horror, how to design a tale of terror, how to simulate the fall into a fractured mind, how to make the horror more frightening . . . does this sound like something a rational mind would desire? And you say the volume contains two terrifying worlds -- worlds, you say! -- designed to ensorcel those who give in to the magnificent delusions presented therein. Pirates fighting fearsome foes on the high seas? Mankind mangled by the might of Martian monsters? Preposterous. However (perhaps most disturbingly) you imply that -- even though you were able to read each and every word of this tome -- it does not yet exist in a physical form? This volume exists only in some kind of electrical aether that you have the power to access? I believe the first step to the road to recovery is to say its name aloud, together. If its title -- initiated by an arcane inhuman syllable I confess ignorance of -- is as compelling as you claim, then surely I would not be immune to its charms, correct? GURPS Horror. See? 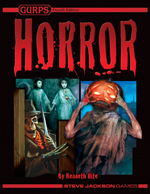 There is nothing so enticing about the name GURPS Horror that pushes preternaturally to pursue its power. GURPS Horror. I could stop saying GURPS Horror at any time that I so desired. GURPS Horror. See? I've stopped again. GURPS Horror. And again. Yet the truth is revealed! GURPS Horror! Its letters trip off my tongue, and its words my mouth devours, like my mind in the maw of an uncaring universe! GURPS Horror! GURPS Horror! GURPS HORROR!! !